If you are in a hurry and just want to find out what the best instant tent is, then we recommend the Timber Ridge 6-Person Instant Cabin Tent. No matter how comfortable or roomy your tent is, none of that matters if you can’t set it up! Luckily, instant shelters are no longer a distant dream. Here’s our guide to finding the best instant tent so you can get on with the more enjoyable parts of camping. Timber Ridge 6-Person Instant Cabin Tent. What Are the Advantages of an Instant Tent? Maybe you grew up with tents that are overly complicated and require an entire bag of poles. Or maybe you’ve never upgraded from the patched up and outdated tent of your childhood. No matter what kind of tent you’ve used before, an instant tent will change your camping experience for the better. Not convinced? Here are a few of the advantages of an instant tent. Of course, the top perk of an instant tent is how quickly and simply you can set it up. Rather than walking back and forth and side to side straightening and threading poles, you make a few quick moves and you’re ready to camp. After all, the tent is mostly for sleep, right? No reason to spend hours getting everything just right. The best instant tent is not only an easy tent to set up, but it’s also lightweight. Thankfully, most popup tents use lightweight materials to make the whole process simpler. Therefore, you can expect the instant models to weigh less than full-framed tents. At the same time, you’ll probably find packing the tent to be easier too. That’s because the poles often come integrated into the tent material. Fewer things to disassemble means teardown is fast as well. Maybe you’re someone who camps solo and doesn’t have an extra set of hands to help pitch a tent. Or possibly you have health challenges that leave you struggling to make camp. An instant tent might solve those problems and make camping accessible again! Pop-up construction, lightweight materials, and ideal maneuverability mean nearly anyone can set up an instant tent. There are plenty of great reasons to choose an instant tent. But what features should you look for when shopping? Here are our recommendations for what to look for in your new tent. Compare weights for the models you’re looking at to see what will work best for you. You might find that although one model is heavier, it still offers a quick and easy camp setup, “outweighing” the drawback of a heavier packed weight. In general, instant tents use integrated poles, but the materials can vary. Some tents use fiberglass poles while others use aluminum. Performance can vary across the material types, so that may be a consideration over the long term. Regardless of what type of tent you’re buying, it’s important to figure out how much space you need. If you’re a solo traveler, for example, you might not need a six-person cabin tent, no matter how easy it is to set up. Think about what gear and supplies you need to bring with you, as well as how many people need to fit. Just because a tent is easy to pitch doesn’t mean you need all the space and features it offers. Because instant tents often use one-piece construction, with the poles and walls connected, it can be hard to clean them. Therefore, features like removable inner liners or floors can help clean the tent out before packing it back up. Other interior features like lantern hooks, pockets, and electrical cord access ports are also common. It should be easy to choose the best instant tent, right? Not necessarily. You should consider your comfort and accessibility needs, your budget, the climate where you’ll be camping, and more. Here’s how to choose the best tent for your needs. Do you camp year-round or will a three-season tent suffice? Do you need lots of cross-ventilation to prevent moisture, or is a full-coverage rain fly more important? 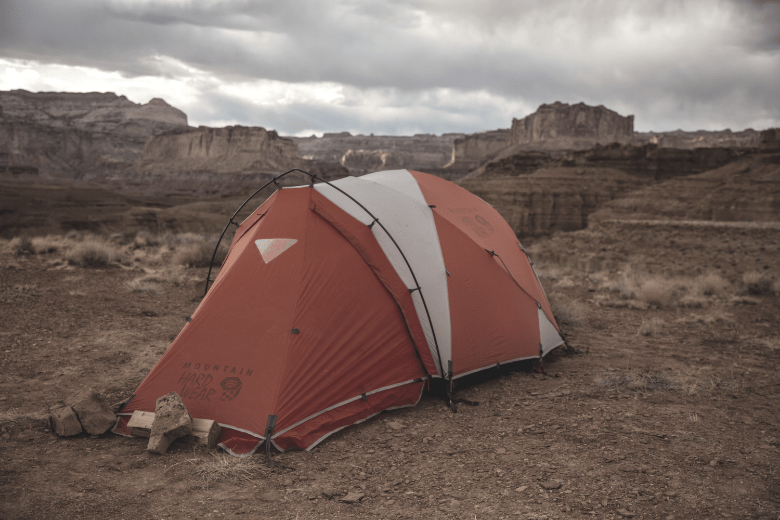 Finding the best tent will require a comparison of features depending on the weather conditions where you travel. Though instant tents are often easier to set up than standard tents, they’re not ideal for everyone. Some work similar to pop-up shade awnings, with a bundle of poles in the center. Check out whether the tent you want has a push-button operation or if it requires some serious muscle to set up. The CORE Equipment 4 Person Instant Dome Tent uses an integrated frame system, so setup is as simple as unpacking, unfolding, and clicking the poles into place. CORE claims that the build only takes 30 seconds! However, the stiffness of the poles may mean you need more than one set of hands to get the tent upright. You can expect to use a bit of muscle working the frame into place. Once it’s up, however, the tent can withstand windy conditions exceptionally well. Plus, the dome shape means you won’t have to reach too far when it comes to extending the poles. The tradeoff is a lack of headroom, though- the center ceiling height is a mere 54 inches. The material features H20 Block Technology for water resistance, and there’s plenty of mesh to allow air to flow through. An electrical cord access port keeps you from leaving the door hanging open, which makes running extension cords convenient. It may look like the traditional cabin tents of yesteryear, but you won’t find any bulky aluminum poles with the Coleman Instant Cabin. Instead, the frame poles meet in the middle of the ceiling. Popping them into place is way easier than the hunt-and-match of older cabin tent versions. However, people who are below average height may struggle to reach the center pole mechanism- the tent’s ceiling is six feet high. Of course, that only adds to the ambiance inside- plus, you can fit two queen size beds in this floor plan. As far as interior comfort goes, the integrated rain fly keeps things fairly dry. However, if you plan to camp in really wet conditions, you might want to invest in another rain fly for better coverage. Overall, visibility is great thanks to the mesh windows. At the same time, the higher windows mean there’s less chance of water getting in the bottom of the tent. Another cabin tent that looks more difficult to assemble than it truly is, the Timber Ridge 6-Person Instant Cabin Tent takes mere minutes to set up. A six-person capacity is impressive, and the center height is substantial, too, at over six feet. Steel poles mean sturdy construction, but a SPEEDUP “quick open system” gets you up and going fast. Thankfully, the takedown is just as straightforward. And even if you don’t have six people to fit in there, it may be worth the storage space and ambiance to pack this tent along on solo trips. Though there are plenty of windows for ventilation, the Timber Ridge instant tent offers great protection against the elements. Its bathtub floor ensures that no water gets in at the seams, and it seems to resist wind admirably, too. It might be tough to maneuver the tent back into its bag- story of every camper’s life- but that’s almost a non-issue with all the other benefits of this popup tent. The manufacturer claims setup only takes 90 seconds with the Gazelle 22272 T4 Pop up Portable Camping Hub Tent, but even if it takes ten times that it’s still worth the investment. A total of 61 square feet of floor space means this tent is relatively compact, but a 78-inch ceiling height means you won’t have to duck to get around. There’s also the removable floor panel to consider- no taking the dirt or sand home with you since you can remove and shake out the liner before packing up. A fiberglass pole popup system is quick and easy, and the all-metal hubs help avoid breakage as you’ll often see with cheaper materials. And while other brands may struggle with their tiny zippers, Gazelle’s YKK zippers are rugged and easy to grasp. Of course, with six windows and two doors, you need the toughest zippers you can get. Speaking of the windows- there’s tons of cross-ventilation with the uniquely shaped Gazelle pop up tent. And while the floorplan is small, there’s little to no unusable space thanks to the cube shape. This innovatively shaped Toogh 2-3 Person Camping Tent may look small, but the design maximizes the inner space. The ceiling height is 67 inches and the hexagon shape can accommodate up to two adults and two children, according to Toogh. With the notation “fast pitch,” Toogh claims it takes mere seconds to set up the hexagonal tent. The pop-up feature looks a lot like popup awnings, but it may take a little practice before you can set it up as fast as the company claims. Still, the hydraulic function means you can lay the tent out, pop it up, stake it down, and be on your way to the campfire in no time. One potential drawback is the absence of actual windows. However, with two doors taking up nearly half the wall space, you may not need them for visibility or ventilation. When it comes to the best instant tent on the market, it’s tough to choose a favorite. After all, who can argue with an under-five-minute setup time on any of these popup tents? Still, one tent does stand out above the rest for ease of use and practicality- the Timber Ridge 6-Person Instant Cabin Tent. Not only does it take just moments to set up, but it has the sought-after bathtub floor and an optimal center height of 78 inches. This tent offers all the comfort and practical features of a traditional cabin tent without the stress of setup, making it the perfect (and affordable) pick for anyone shopping for a new popup tent.